ella and sage are just now finishing up their first album together, right before ella leaves ojai! 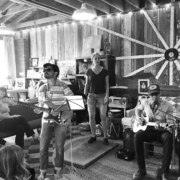 a double dish of some of ojai’s sweetest music: kindhearted guitar wizard eric soullivin & the dynamic duo of guitar, voice & tap, bernie larsen & cassidy linder. 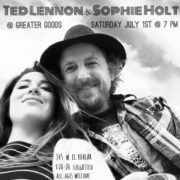 an intimate night of music with honey-throated songbirds Ted Lennon & Sophie Holt! 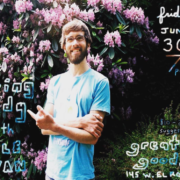 Ojai flavored folk, r&b, & more. 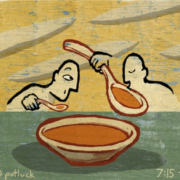 A five week series of interactive workshops that look at the human impulse to work compulsively, to consume addictively, and to use and exploit resources and labor mercilessly. The Harlem of the West SF Project is a book, website and photographic exhibit that celebrates the bustling Fillmore jazz era of the 1940s and 1950s, a period when the Fillmore was a vibrant neighborhood of more than two dozen nightclubs and music venues within its one square mile—all of which virtually vanished due to redevelopment in the 1960s. 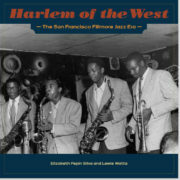 The project celebrates a unique and rediscovered chapter in jazz history and the African American experience on the West Coast. 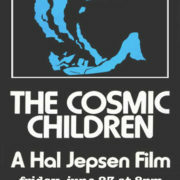 the first of hal jepson’s many classic films, “cosmic children” helped to set the template for a more natural pairing of counterculture music & progressive surfing (1971). click the pic for a sample. 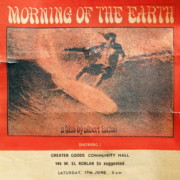 Morning of the Earth ( 1972 ) made by Alby Falzon was intended as an environmental statement presenting or suggesting an idealistic world in which surfers lived in harmony with the powers of nature. This was presented without narration or sub titles, and without any attempt to identify the surfing or the surfer’s locations, using music and imagery to provide an emotional context, and the lyrics of songs to reinforce its simple message. 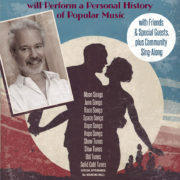 Zavier will sing and perform at the mighty Wurlitzer upright piano a selection of great well-known and obscure songs from then to now. Musical genres will range from Tin Pan Alley, to blues, to early Jazz, to rock, pop, folk, and country. 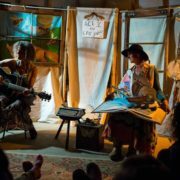 There will be many sing-along songs some led by the bouncing ball. 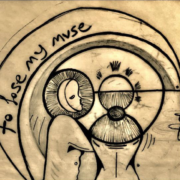 Accompanying the presentation will be a fascinating slideshow featuring—in addition to song lyrics—many rare historical graphics relating to the music. A few guest artists, such as Will Ryan “The King of the Radio Cowboys” will also do their respective things.